Donate to H.O.M.E. here (write in "marathon" in note section). Donate to Fred's Team here. Everything is set back a bit this morning, including this blog entry. It so happens that it took Tristan und Isolde a long time to finally die last night. And Wagner took about five hours to resolve. But it was worth it. Good ol' Dickie Wagner knows how to write some music. First party: I love you. Second party: I love you, let us surrender to night and to death. Third party: How could you betray me, my truest friend? I will kill you. Basically a typical monday night in my romantic life too. Just fewer magic potions. The coolest part was seeing Alex Richardson in the role of the shepherd. I sang next to Alex last year in the St James choir. I'm hoping to run the Portland marathon (this Sunday) in under 3 hours and 52 minutes. This requires that I average a pace of 8:51 for all 26.2 miles. For a professional, this would be difficult in its slowness. But for me, this will be difficult in its fastness. It will require the perfect day. But it is doable. And I'm going to aim to do it. Standing against me is the past. 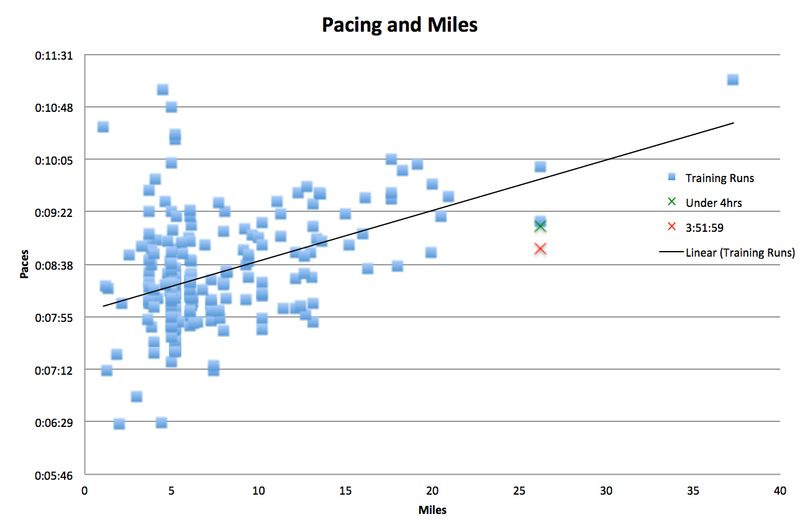 This will require that I trim 23 seconds per mile from my Chicago Pace (1 min, 7 secs from NYC pace). That is not insignificant. But Chicago was very hot and I ran out of salt and my calf started spasming. I think I can find a few seconds there. And NYC was run under special conditions. Standing for me is my training. 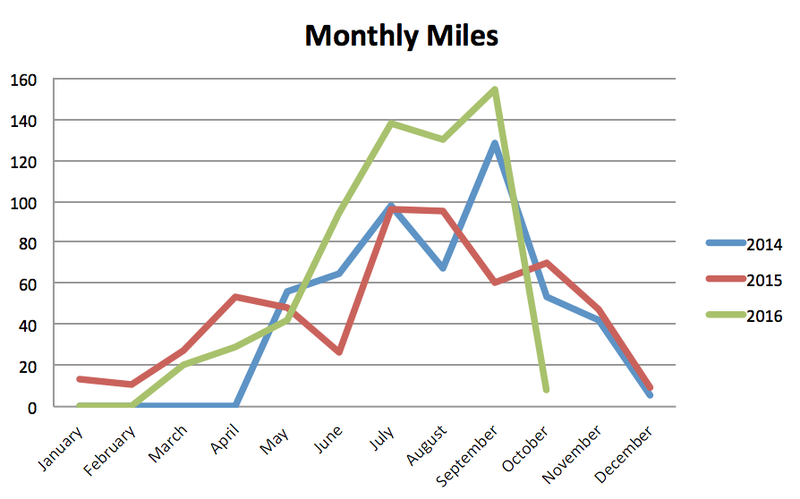 I logged more miles this year than the last two years (see chart above). I changed my training plan to be a bit more aggressive and I think I actually did a few more of the recommended hill repeats and speed workouts. I'm hoping the race goes like one training run in particular. My last 20 mile run went rather well. 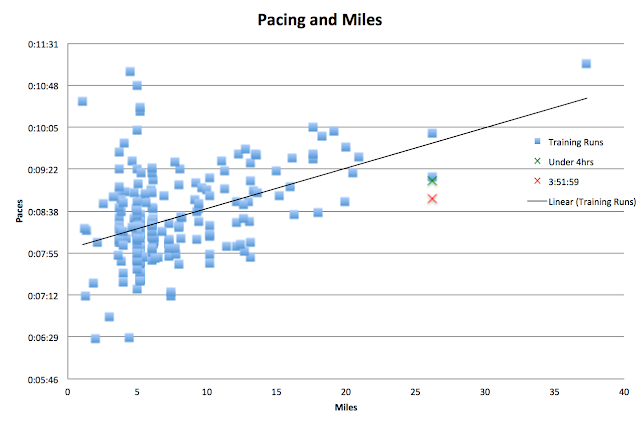 I ran negative splits and averaged an 8:48 pace. 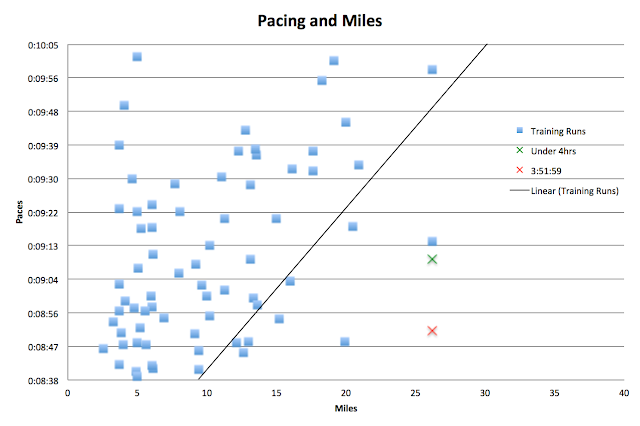 And the last mile, the only one I measured individually, was an 8:15 pace. I don't think I could have held that pace for 6 more miles, but I could have kept it for 2 or 3. A fast run, a feeling good run? I'll take it. 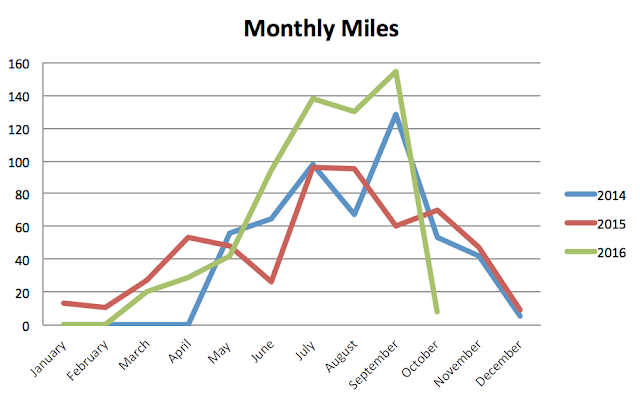 The chart below includes all of my runs from this year and the two previous. Seems like there should be more little squares. Enjoy the bright colors and find that really promising 20 mile run. I spent a lot of time getting Excel to make these colors. So please enjoy it. 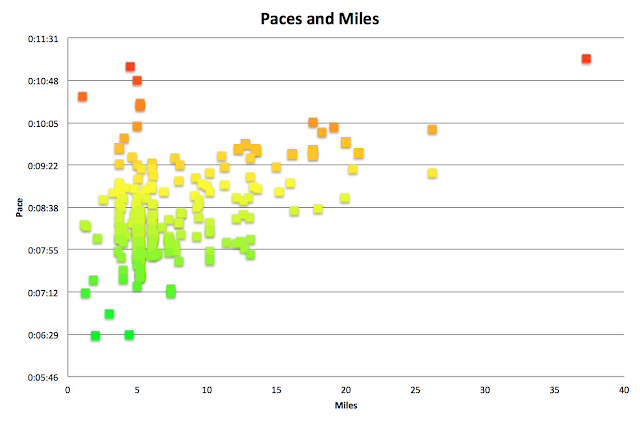 This is the same data, I just colored each spot blue and dropped in the different desired paces required to catch different goals. I also added a trend line, because why not. And lastly, I've zoomed in to the important marathon region. That trend line is looking rather steep now. So there you go. You have the same data I have. 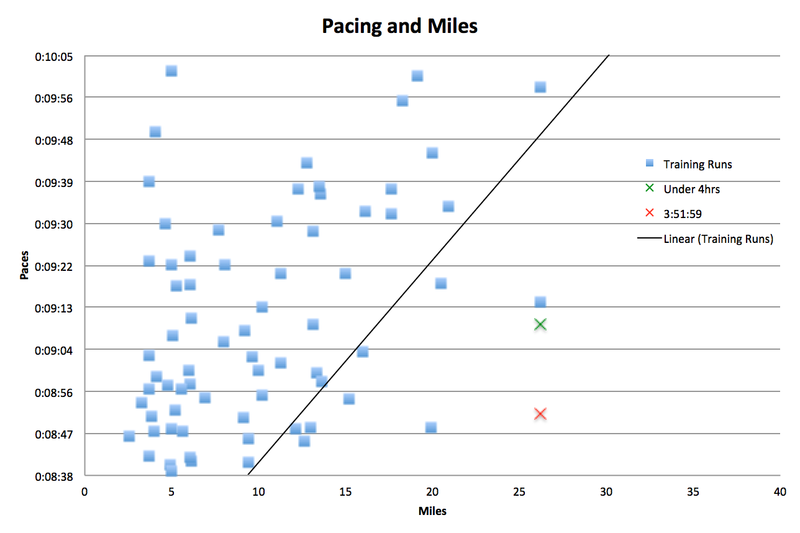 You know what paces I'm likely to run. Now it is time to bet against my training, my will, my heart, my fueling, my tummy, the weather, the course, and whatever else may affect my running time. Make your donation bets by using this form. Then fulfill your bets either after the race on Sunday, or after the NYC race - if you are taking the double down bet! One Week to Portland: Speed Betting!